I needed to get to IAH airport for a 2 week business trip. The business part meant I could expense it, within reason and the best option (which I too often forget about) was the 1 way rental with AVIS. It ended up at $42 with no surcharges. I don’t know if you’ve noticed it but renting cars from their franchised office (instead of a airport rental or implant) is a hit of miss affair with respect to their service. 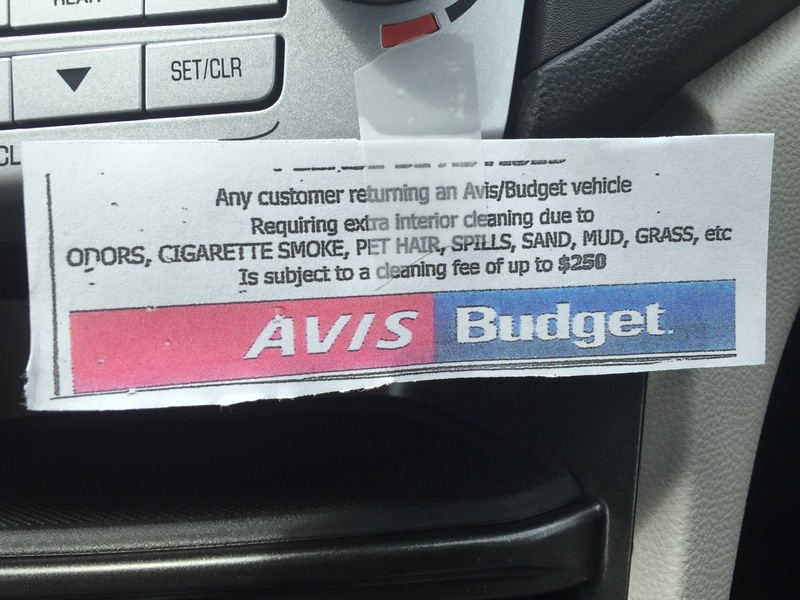 One thing I have noticed, at least with AVIS franchises, is the specific warning that that they will charge you for additional cleaning if you return it back dirty – Just look at this one attached that I got the other day. I remember similar warning from a franchise in San Antonio but their pet peeve above standard no smoking , was actually a peeve about pets – dog hair. I don’t recall this from airport rentals other than the standard warning about no smoking in the car. But look at this notice where it included sand. Last year when the Imperial Family visited North Carolina, we returned the car rental with quite a bit of sand in it but no comment from the car rental company. Wow- This opens up how much is normal ‘dirtyness‘ is allowed here? The Odors and Cigarette, I get. You smoke, the car will stink and it is common policy to surcharge even in hotels. So it is then with Pet hair which if all over, is going to be all over so will require additional cleaning especially if the vacuum will not pick it up. The same with spills which may have stained. ..but sand or Grass – Surely vacuuming should sucking this up anyhow? At what point do they detect a grain of sand versus having to professionally detail a car is not clear here when that $250 amount is invoked.